Consuelo Wilkins, MD, MSCI, has played a major role in the development of the national All of Us Research Program, an ambitious effort led by the National Institutes of Health (NIH) to accelerate the prevention and treatment of illness through precision medicine. 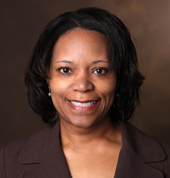 Now Wilkins, executive director of the Meharry-Vanderbilt Alliance and a national leader in community-engaged research, has been appointed director of a new Engagement Core to support the program’s design, implementation and governance. Specifically, the core, which is based at Vanderbilt University Medical Center, will select and integrate a diverse group of “participant partners” to ensure the success of the program, which this spring will begin collecting and analyzing health data from 1 million or more volunteers. On April 20, the NIH announced an additional 22 participant partners who will serve on the program’s advisory and governing bodies and on working groups and task forces to provide input on research priorities, privacy and security and the meaningful return of health information volunteered by participants. “All of Us has made engagement a high priority, and funding for our core means that NIH recognizes the considerable time and resources required to meaningfully engage participants from diverse backgrounds with varying resources and experiences,” Wilkins said. Involving participants as active collaborators represents a significant shift in research, which until recently offered little to no involvement to the public beyond volunteering in a study, Wilkins added. The core will ensure that participants are embedded as central partners and empowered to contribute to all aspects of the research. The Engagement Core is working closely with Dara Richardson-Heron, MD, chief engagement officer of All of Us Research Program, who oversees all of the program’s engagement efforts. VUMC is partnering with national experts experienced in engaging individuals and communities, including those often underrepresented in research. Key functions of the core will include preparing participants to work with researchers and supporting researchers in their efforts to engage participants. Experts in the core include Karriem Watson, DHSc, MS, MPH, director of Community Engaged Research and Implementation Science in the University of Illinois Cancer Center, and Elizabeth Cohn, PhD, RN, Rudin Professor Hunter-Bellevue School of Nursing, Hunter College, City University of New York. They will develop resources and implement training to help overcome inherent barriers to partnership between researchers and participants including differences in group norms and lack of common language. Other experts include Laura Beskow, MPH, PhD, director of Research Ethics at VUMC, and, at the University of Arizona College of Nursing, Usha Menon, PhD, RN, associate dean of Research and Global Advances, and Laura Szalacha, MPhil, EdD, director of Research Methods and Statistics. They will develop qualitative and quantitative tools to assess readiness, trust, collaboration, dissemination, communication and other measures of participant engagement. Other VUMC team members include Alecia Fair, DrPH, research assistant professor in the Meharry-Vanderbilt Alliance; Kathleen Brelsford, PhD, MPH, research assistant professor of Health Policy; Catherine Hammack, MA, JD, associate in Health Policy, and Society; and Ashley Bachelder, MPH, MPS, translational research coordinator, Institute for Medicine and Public Health. During the program’s planning phase, Wilkins spearheaded the effort to gather face-to-face input from nearly 700 individuals across the country, about half of whom were racial and ethnic minorities. Her team engaged rural communities, sexual and gender minorities, older adults, individuals experiencing homelessness and individuals who are blind and deaf. VUMC also leads the All of Us Data and Research Center, which is directed by Joshua Denny, MD, MS, a pioneer in Vanderbilt’s precision medicine efforts. The Meharry-Vanderbilt Alliance develops and supports collaborative initiatives and programs in biomedical research and clinical science training between VUMC and Nashville’s historically black Meharry Medical College.